Jul. 23, 2016 9:00 a.m.
All Ryan Denman didn’t care what colour medal he won, as long as he won. 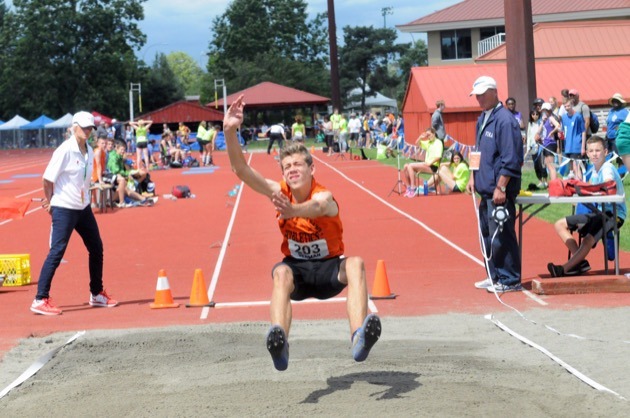 The 15-year-old from White Rock won the boys long jump competition with a leap of 6.08m on Friday afternoon at Abbotsford’s Rotary Stadium on day one of the BC Summer Games. “I wanted to get on the podium and from there, I didn’t care,” he said. Denman was one of two zone 4 athletes to find the podium as Surrey’s Ryan Pederson took bronze after leaping 5.71m. Sandwiched in between the two athletes was zone 3’s Ian Vandergugten of Langley.